Uzwil (Switzerland), January 13, 2017 – Bühler offers visitors to the Interpack 2017 trade show a unique experience with new solutions, numerous innovations, automation, and services across the food value chain. Building on the Bühler Networking Days, themes of sustainability, food safety, nutrition, and the opportunities of the Internet of Things are highlighted under a general motto of “Feeling Good about Food”. The Interpack is the most important and the largest trade fair for processing and packaging equipment. It will be held in Düsseldorf, Germany on May 4–10. Bühler will present its complete range of process solutions in an exciting experience world covering 1700 square meters. In this unique environment that includes a bistro and a Solutions Space, Bühler will display its offerings for making chocolate products, cocoa, nuts, coffee, sweets, biscuits, cookies, crackers, cereal and energy bars, breakfast cereals, and snacks. Bühler is a global leader in processing solutions with 60 percent of all chocolate products, 40 percent of all industrially produced pasta, and 35 percent of all breakfast cereals made on Bühler technologies. 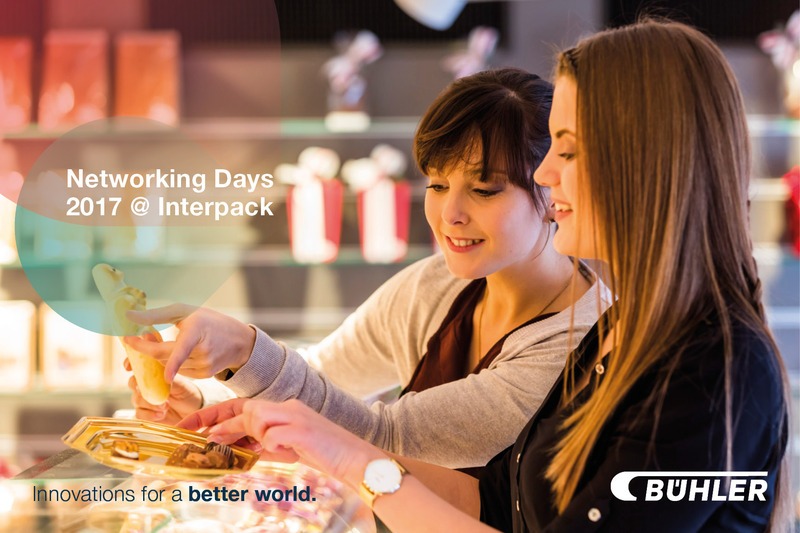 The Buhler Networking Days 2017 @ Interpak will feature four core themes that strongly impact the food processing industry: sustainability, nutrition, food safety, and the growing importance of the Internet of Things. Highlights of the event are some 15 innovations, expert presentations on the four core themes, side events, and an exclusive networking dinner hosted by Bühler.